May’s Writing Matters panel is on niche mysteries–so far we have crafts, pets, and recipe writers confirmed–and this is a slice of the genre I know very little about. So I was especially glad when Dorothy Bodin contacted me about writing a Moment. Below, she exposes what makes for success in a whole new area of publishing. I suppose for many of us, the Made It Moment would be when we made our first sale. That was an exciting day for me, but the last few rejection letters I’d received gave me hope that, with luck, Darkness At Foxglove Corners, would find a publisher. So when I received an acceptance from Five Star with an advance, I was very excited. But two other moments stand out in my memory. In the summer of 1976, the Bicentennial year, I was buying every Gothic novel I could find and watching television, something I almost never do today. My favorite program was a woman’s western, and when I sat down at my typewriter, I thought, Why not write a western Gothic? I’d never heard of mixed genre, but that was what I wanted to do, and that was the way The House At Trail’s End began. I finished my book that summer and started sending it to publishers. Although I received a few encouraging comments in rejection letters, in the end I couldn’t find a market for it and eventually stored it on a closet shelf. Because I still had faith in my work, occasionally I’d reread it, make a few changes, and look for another publisher, with no luck. I learned that mixed genre is a hard sell. One publisher offered to consider it if I would add more romance than mystery, but I didn’t want to tamper with it. Fast forward several years. Having made my first three sales, I returned to The House At Trail’s End. This time I had the manuscript professionally critiqued. To my amazement, the reader loved the story and suggested only one or two changes. That was my first Made It Moment. With a few minor revisions and another title, Treasure At Trail’s End sold to Wings e-Press and received wonderful reviews. It’s available at their site: http://www.wings-press.com and at Amazon. My next Made It Moment came around the same time. About a year after Hilliard and Harris published The Cameo Clue, I received a royalty check. I expected the usual $17 or $20 and was shocked to find much, much more. Thinking the publisher had made a mistake, I called her. The mistake was she’d forgotten to inform me that Harlequin Worldwide Mystery Book Club had selected The Cameo Clue for their line-up! I realized then that someone, besides my publishers and a few reviewers and fans, liked my writing. Since then, Harlequin gave me four more Made It Moments, the latest one being the selection of Love, Deadly Love (Hilliard and Harris) for their club this March. I’m proud of all these Made It Moments and grateful to the people who made them possible. When my new Kindle arrived, the first book I ordered was Treasure At Trail’s End. Dorothy Bodoin lives in Michigan, where she taught secondary English for several years, beginning my career in an old junior high school built on a hill. It served as a model for the fictitious Louisa M. Alcott Middle School in my novel, Love, Deadly Love. Dorothy’s books are notable for their Michigan settings, Victorian houses, and collie characters inspired by her own dogs. Her latest book is Another Part Of The Forest, the eleventh in the Foxglove Corners mystery series, released on February 1, 2011, by Wings ePress. That’s why it’s nearly impossible for me to pick a “Made It Moment.” Because I know I’ll just have to start again at the bottom a few minutes later. I’ve known television writers and directors who’ve gone from holding an Emmy in their hand straight to the unemployment office the following Monday. Actors whose picture is still on a magazine cover when they’re once again waiting tables to make ends meet, and authors with bestsellers dropped by their publishing houses in the middle of a series. When did I know I’d made it as an author? Well, I initially thought it was when I sold my first Regency romance novel back in 1993 to AVON. That line promptly closed. Or maybe it was when I got a two-book deal for stand-alone contemporary romance titles with DELL for more money than I’d ever made previously. That editor promptly quit. Was it my five-book Figure Skating Mystery series with Berkley Prime Crime? Following the 2002 Olympic judging scandal (which I actually fictionalized in my first outing, “Murder on Ice,”) interest in skating plunged worldwide. Wait! I know! It must have been my two “New York Times” best-sellers, “The Man From Oakdale,” a tie-in to the soap opera, “As The World Turns,” and “Jonathan’s Story,” a “Guiding Light” tie-in. “Guiding Light” was cancelled in 2009. “As The World Turns” in 2010. ALINA ADAMS is the author of four romance novels, five Figure Skating Mysteries, two books of non-fiction, and three soap-opera tie-ins. Her enhanced e-book, Skate Crime: Multimedia is available at Amazon.com. She can be reached via her website, http://www.AlinaAdams.com. Sasscer Hill’s Moment recalls a favorite Jimmy Buffet song of mine when she talks about five years slipping by while on sub. Man, could I relate to this one. I think some of you will, too. Because, you know, sometimes the best things happen when we finally let go. Sometimes, to quote another song by Cold Play, what we want is not what we need. And so to Sasscer I simply say, with tears in my eyes, Hear, hear! You’ve made it. I believe that when you hit the New York Times Best Seller list, you’ve made it. But let me speak in more realistic terms about my “made it” moment for my first novel, FULL MORTALITY, a horse-racing murder mystery. In 2005, after years of querying literary agents, I finally landed one, and being a neophyte, I thought my novel would be on bookshelves within months. My agent felt the book was good enough to lure a big New York publisher, and so we sent out the manuscript of FULL MORTALITY, waited for months, got rejected, sent the manuscript back out, waited for months, received more rejections, etc. My agent continued to steer me away from the small publishers – there just wasn’t enough money in it for her. In the meantime I wrote a second Nikki Latrelle novel, with the working title RACING FROM DEATH. It lingered at Bantam, New American Library and Berkeley for a total of thirteen months and was rejected. And so, five years crawled by. A year or so ago, John Betancourt, publisher of the small Wildside Press, offered to publish the second in my Nikki Latrelle series, RACING FROM DEATH. I said thanks, but I want to wait for a New York publisher and the “big deal.” I waited and waited on these people while Wall Street, the horse racing, and book publishing markets crashed. Finally, I couldn’t stand it anymore. With the blizzard of 2010 scheduled to hit Maryland the next day, I emailed the first in the series, FULL MORTALITY, to Betancourt. He read it and accepted the manuscript for publication that night! That was a great moment, but not one where I felt I’d arrived. That one happened a few weeks ago when I got an email regarding a favorable review from “Ellery Queen’s Mystery Magazine.” I starting reading the review. I had to put the review down because I was crying. I knew FULL MORTALITY had finally made it. Sasscer Hill lives on a Maryland farm and has bred racehorses for many years. A winner of amateur steeplechase events, she has galloped her horses on the farm and trained them into the winner’s circle. She is the author of several mysteries in the “Chesapeake Crimes” anthology series, and her articles have appeared in numerous magazines. Full Mortality is her first novel. One of the things I love about the internet is the way it compresses a world bigger than most of us have ever had the opportunity to know. All of a sudden, I have friends zig-zagging across the US, in Canada, England, Germany, Sweden–and now, Siberia. Jenny was kind enough to ask me about my “Made It Moment.” The concern I have can be formulated thus: what was I attempting to MAKE? True enough, in today’s hyper-rational, hyper-tense, hyper-fast world each one of us finds his or her own motivation for moving ahead. The phrase ‘making it’ has the smell of progress, the taste of achievement, the sweet victory of success. But why this compulsion to victory? And how does one measure success? While these questions are not easily answered, and while they underlie my own curious turns in life, I shall simply try to understand what ‘Making It’ now means for me. I thought I had made it when I got my first article published in a referreed international philosophical journal back in the early 80s. I thought I had made it when I received my first college teaching appointment. I thought I had made it when a respected university press published my first book a few years later. I thought I had made it when I became a successful management consultant making ungodly sums of money. I thought I had made it too many times to recount. Unfortunately the premise was always the same: that I needed to keep moving forward and make something of myself, remain focused on some future event that really does not exist. After living a few quite different lives – as academic, author, businessman, consultant, music producer, professor and more – I have come to an odd conclusion. Making it, becoming successful, advancing in the spectacle, is not what matters. Or let me rephrase that; working to become somebody is antithetical to life. To focus on the future, on achievement, is to lose the present moment. Time is not like a river stretching out before us. We are not objective observers standing on the shore, watching some past go by, or waiting for a future event to arrive. We are under the spell of a great spectacle, my friends. And the organ grinder keeps shape-shifting with every new technology and promise they place before us. I stopped trying to achieve anything years ago, and I know I am happy. I am living now in Western Siberia (Russia) with my wife and young child. Instead of participating in the menagerie, I just accept who I am and what I can do everyday. I write, I listen to music, I cook, I clean, I take care of my son, and very often I do nothing at all, especially when the temperature drops to minus 20 or minus 30 Celsius. If you read one book this year, let me humbly recommend my philosophical memoir, The Recovery of Ecstasy: Notebooks From Siberia. It has won no awards, and has modest sales; but it will make you rethink your entire life and what you are trying to make of it. Then, you can write to me and tell me if “you’ve made it.” I send you all my warmest wishes. Sandy Krolick graduated with a B.A. in the History of Culture from Hobart College in New York, has a Master’s degree from the University of Chicago’s Committee on General Studies in Humanities, and a Doctorate in Religious Studies from the University of Virginia in Charlottesville. After an early life spent in both music and driving a taxi, then a ten-year career in academia, he spent the next twenty years in the executive ranks of several American firms, including Ernst & Young LLP, General Electric, and Computer Sciences Corporation. Sandy has spent years traveling the world, including parts of Asia, Africa, Europe, Kazakhstan, Russia and Ukraine. Retiring from business at the age of fifty, he recently returned to the USA with his wife Anna, after living and teaching for several years in the central Siberian Steppe, at the foot of the Altai mountains in Barnaul, Russia. Please welcome Wendy Gager to the blog. Wendy proves that your Moment can come not only when you least expect it–but at a rather inconvenient time! I was teaching a writing class for Baker College and the computer room was quiet except for the sound of keystrokes. My students were doing last minute corrections to their final documented essay that was the bulk of their grade for the class. I admit I was bored. To keep myself from sleeping, I surfed the internet and then checked my emails. One email stopped me cold. It was the notification that A Case of Accidental Intersection had taken first place in the Dark Oaks Mystery Contest and Oak Tree Press wanted to publish my book. I wanted to scream, pound on the desk, jump up and down but I couldn’t. My students needed the concentration to do the final proofing on their papers. My adrenaline was pumping and no place to expend it. I thought about quietly leaving the classroom, running to the parking lot and screaming the news. Instead, tears of joy cascaded down my cheeks as I tried to unobtrusively wipe them away. It was the only silent reaction I could make and it just leaked out. My students started printing their papers and turning them in at my desk. A couple asked if I was alright and I could only nod and they returned to their seats. When the last paper hit my desk, I couldn’t help myself. “My book is going to be published.” I nearly screamed the words and the students just looked at me dumbfounded at my outburst. I then explained the email and I was congratulated. They didn’t even know I wrote a book. Class was over and they filed out, no doubt wondering about the sanity of their instructor. I can’t say I’m any saner now than I was then. I still teach and when in the computer lab, I think about my shock at the email. It has been a crazy ride since then. The third book in the series is coming out in June called A Case of Hometown Blues. I still get a silent thrill when my publisher agrees to the next book, I don’t scream. The mold has been set with the first one. I’ve matured as a writer and take the news in stride, but don’t look too closely. A silent tear may still escape and roll down my cheek. W.S. Gager has interviewed race car drivers and professional woman’s golfers. She enjoyed the fast life of a newspaper reporter until realizing babies didn’t adapt well to stories on deadline. Since then she has been honing her skills with other forms of writing before deciding to do what she always wanted with her life–write mystery novels. Her main character is Mitch Malone, an edgy crime-beat reporter. Please welcome mystery author IJ Parker to the site. Her Moment encompasses a few things that will feel familiar to many of us–but her material has to be amongst the most exotic yet. I started writing my mysteries some twenty-five years ago. From the beginning, it was very hard. I never do things the easy way, and in this case I decided to write about a time and place so remote that I needed a lot of research. I had read mysteries all of my life, and particularly loved those that took me into another, more exotic world. My favorite author was Robert Van Gulik, whose Judge Dee series is set in Tang China. My own choice of setting was eleventh century Japan, and my protagonist is Sugawara Akitada, an impecunious nobleman serving at the Ministry of Justice. Progress was very slow, especially in the beginning when I was still teaching fulltime and also I spending hours in university libraries, delving into Japanese history and culture. Reading required more time than writing, even when you consider that my early books were written on a typewriter. Eventually, the first novel (THE DRAGON SCROLL) got finished, and I sent queries to several major publishers. I think there were about five queries, and five rejections returned. At that point, I put THE DRAGON SCROLL aside and started on number two (RASHOMON GATE). This, too, got done and gathered its rejections, and I began number three (BLACK ARROW). Some years later, I tried my hand at short stories. By then the three novels were still unsold. I admit I’m not good at marketing, and rejections depress me. But one day, by God, about ten years after I started the whole process, the first amazing bit of success happened: one of my stories was accepted by ALFRED HITCHCOCK’S MYSTERY MAGAZINE. Greatly encouraged, I began to revise the earlier novels, started novel number four, and wrote more stories. AHMM accepted all of my stories. In 2000, two major pieces of good luck happened to me: I won the Shamus Award for the story “Akitada’s First Case” and I found an agent, Jean Naggar. The following year, my agent sold two of the Akitada novels to St. Martin’s Press. Since then, I have moved to Penguin, who brought out the complete series of six Akitada novels in their proper order in trade paper. After that I changed publishers again. Severn House published THE MASUDA AFFAIR and THE FIRES OF THE GODS. These titles are hard covers, but paperback versions will follow. It means that eight Akitada novels are now in print. In addition,Random House has produced audio versions of books one through six, and the novels are also available on Kindle and in other electronic formats or soon will be. They are published in twelve foreign countries (Germany, France, the United Kingdom, the CzechRepublic, Russia, Poland, Bulgaria, Israel, Brazil, Indonesia, Romania, and Hungary). From the start, my books have received critical praise. I’m immensely grateful to my reviewers. Their opinions have kept me going on in spite of disappointing sales. 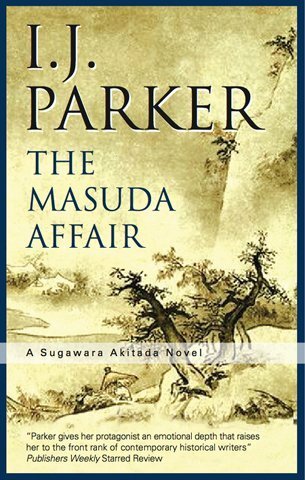 Most recently, MASUDA AFFAIR received starred reviews from PUBLISHERS WEEKLY and LIBRARY JOURNAL. LJ picked it as one of the best 10 mysteries of 2010. THE FIRES OF THE GODS is also making a good start with another starred review from PW, and making its list of the best 10 spring releases for 2011. No, I haven’t made it yet. I’m again without a publisher. But I hope I’m moving in the right direction, slowly, step by step, by the grace of the gods of luck and my loyal fans, and perhaps, just perhaps, there will be a break-through in the future. I.J. PARKER won the Private Eye Writers of America Shamus Award for Best P.I. Short Story in 2000 for “Akitada’s First Case,” published in 1999. Parker began research into 11th century Japan because of a professional interest in that culture’s literature, which led to the first Akitada short story, “Instruments of Murder,” published in Alfred Hitchcock’s Mystery Magazine in October of 1997. Although Parker’s multi-lingual background includes a little Japanese, research is done using translations and the help of scholars specializing in the period. Imagine you’re blowing up this great balloon, it’s brilliant blue or bronze or scarlet, and you’re blowing, and blowing, and blowing, and it’s gonna be great, the biggest balloon ever, you can just see where on the wall you will hang it to welcome all the guests…and then it suddenly escapes your lips and flies all over the room with that horrible farting sound, only to lie dead and shriveled on the floor. I promised you guys no more back story posts because I thought I might be done. I mean, I wasn’t counting chickens or anything. I was knocking wood, and feeling humble and humbled by my time so far in this industry. I was hoping other writers better than I would hurry on their own way to success. But I did think mine was in sight. You see, my agent had found a fantastic editor. An editor who grokked my work. Who seemed more passionate than any of the 13 before who have wanted to acquire something. She was working like crazy at the house to be able to make an offer. A wonderful writer, whom I am not naming only because I don’t have his or her permission, had read my work and offered support, and the editor had already managed to get many of the people at the house on board. I was closer than I’d ever been–and I’ve been close. Achingly close. Things got tenser. I filled out some things for my agent, putting down on paper plans that have been roiling around in my head for years now. The editor had read my other book a year ago, and liked it. Now she wanted to have it on hand again. I admit that I began to get just a little–OK, maybe more than a little–hopeful at that point. (It had been 5 weeks). This was really going to happen. Wasn’t it? No, it wasn’t. There are a lot of moving parts to a publishing house, and a lot of people have to see things the same way for a book to be acquired. It seems baffling to me, because of course, books are acquired every day. But for whatever reason, mine won’t be. Not this time. Not by this editor. My agent has been wonderful. She is a champion in all respects of the word. Her loyalty, faith, and passion are unmatched–every writer should have an agent like this. I have to repay her soon, and I do mean repay. I don’t know what will happen next. I’ve hosted Writing Matters panels on alternate routes to publication. Am I meant to go down one of those roads? Barry Eisler just decided to, but Barry Eisler has been making a living in this industry since he was a young man. He has the means–and maybe more important, the validation, to try something different. He’s also got an audience, but others have shown how that can be built. But the validation. Getting this close this many times doesn’t feel like validation. It feels like I couldn’t hack it in the final minutes of the game. Doesn’t every writer dream of holding her book in her hand–a book somebody else believed in enough to put there? Should I give up that moment we all yearn for? It’s like not getting to go to my senior prom all over again. I don’t know what I should do. Please leave a suggestion. And tune in again. I saw so many similarities in author Kate Gallison’s Moment–and things to aim for, wish for as well. Read on to see the many aspects that go into this business–not just of success, but of being a writer. I’ve been writing ever since kindergarten. I first made it when I handed my very first story to my mother. She was bent over a hot stove, stirring the fish chowder, and she put down the spoon, read it, and smiled. It’s always a treat to please your mother. Since then, there have been many ups and downs. I used to impress my teachers, although I personally no longer admire the stuff I wrote as a kid. Too many adverbs. My greatest success was my first published book, UNBALANCED ACCOUNTS, and you can buy it on Kindle. It was favorably reviewed in the New York Times on the same day it came out, the very day I had a signing at Ann Dodell’s bookstore in Trenton, the store that used to be Traver’s. My old colleagues from various New Jersey state offices lined up and bought copies of the book. We sold fifty or sixty. It was in hard cover. Ann was very pleased. I made the advance back with a thousand dollars to spare. That was a tremendous thrill, although it wasn’t quite time to quit my day job. Kate Gallison!” she said. That was a thrill. She was impressed, and she didn’t even know me. success seems just beyond my grasp, but you never can tell how things will turn out. Kate has three grown sons and a bachelor’s degree from Thomas Edison College. She lives in Lambertville, New Jersey, with her librarian husband and their cat. There she divides her time among her family, her writing, and various civic pursuits. She is a member of the Author’s Guild, the MWA, Sisters in Crime, and St. Andrew’s Episcopal Church. She is descended from a convicted Salem witch. August 2009, Killer Nashville writers’ conference. A friend and I are there to enjoy the seminars and to pitch story ideas to the guest editors/agents. In the short story seminar an editor from Echelon Press stands up and announces her company was looking for short stories. Sunday, before I left, I talked with her about ten minutes about my short stories, then about a couple of novels I had also written. She gave me the information for submitting. September rolls around and the three other submissions I had made to the three agents were summarily rejected. In early October, I saw an email from Echelon Press in my IN box. The first thought I had was, “Well, here we go again. Another rejection. Time to look somewhere else.” When I opened and read the email, I expected to see the standard, “No thanks. Not for us. I wish you well in your writing endeavors.” However, after reading it, I realized the words didn’t constitute a rejection but an acceptance. So I read it again. Then I read it a third time to realize Echelon didn’t want just one of my novels, they wanted both. I thought, ‘This is it!” After years of hard work, rewrites, critiques, and scores of rejections, somebody was going to take a chance with me. The heart raced faster, my brain went whirling, and I didn’t know what to do next. I called my parents and let them know the good news even before responding to Echelon. In January of this year, I was also informed that Echelon had also accepted four out of the six short stories I’d submitted. Stephen Brayton is a Fifth Degree Black Belt instructor in the American Taekwondo Association. In 2009, while attending the Killer Nashville conference he was fortunate enough to meet Mary Welk of Echelon Press, who helped launch Stephen’s publishing career. …is actually not a book, unless it’s published. Right? Isn’t that how so many of us feel, even about manuscripts that are garnering great praise, maybe offers from agents, or interest from editors, awards from foundations, even blurbs from authors? That we’re still not quite “real” until that book is, well, being read. In ON WRITING Stephen King talks about how an unread story is a circle not closed. Anyway, all those editors were turned down by their editorial boards. The reasons were, well, crazy. One house said it was too literary for suspense–too much time spent on the characters. OK. That could make sense. Even though that character development seemed to be what was unique about my work according to many who read it. Still, cross-genre can hit a sweet spot, but it can also be a tough sell. Except that another house called the novel too fast-paced and said they would *see it back if I slowed it down*!!! I’ve concluded that reasons are tea leaves. They mean nothing and you can read what you want into them. Actually, an astute tea leaf reader can probably derive more from the dregs at the bottom of a cup. A couple of things happened then. One, I got scared right down to my toenails. I mean here I am, moderating a panel on the Brave New World of publishing, hearing that micro presses and straight to Kindle options abound, while remaining the most die-hard devotee of the Old World as one could find–and yet that old world just would not let me in. So two, I started contacting authors whose work I loved. Now authors, especially award-winning, top-selling ones, have mountains of mss to read (more lingo). Their agents send them some. They are contractually obligated by their publishers to read others. In short, they have absolutely no reason to read mine–it’s not like most aspiring writers are lucky enough to be friends with best-selling authors. But read my book they did, usually after agreeing to look at a first chapter or two, then offering to read the whole thing. And they provided blurbs. One especially kind author even sent his blurb to the entire world, or at least 5000 or so mystery readers and writers in it, so that I wound up getting emails asking, Hey, where can I read the book? Uh, nowhere. Not yet anyway. I can only thank these gracious authors for their kindness and their time, and hope that someday a book will be available to be read–with these authors’ words on it, and drawing new readers to their work. Right now we are poised waiting to hear if another deal will be offered. We should hear any day. Based on past events, I am just out and out scared. And I guess that’s where I have to leave my back story. You’re caught up. I hope I catch up one day, too. I hope that like the circles that have come before, mine can be closed as well.